These quality 60mm resin bases create a craggy highland or mountainous scenic environment showing realistic jutting rock outcroppings, each base is unique with different scenic elements such as, with weathered, sloped, jagged, layers, and striations. They are well suited for use with all gaming miniature products in any game setting including fantasy, sci-fi, cyber-punk, etc. They are an excellent choice for Warhammer 40k army commanders seeking to set their troops apart of create a unique setting for their troops or to create a unique backdrop for that special miniature for D&D, Pathfinder, or any other role playing game. 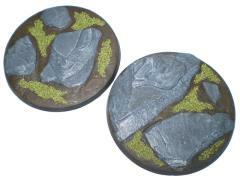 This item includes two unique 60mm highland crag bases.